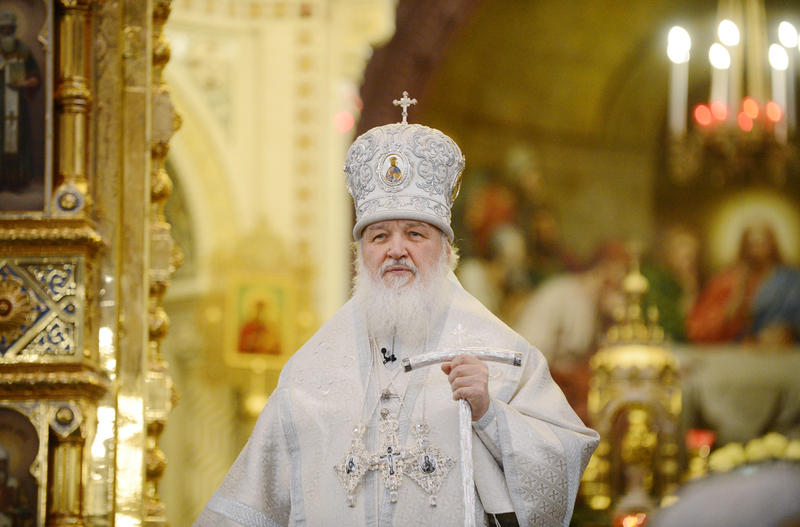 Christmas Message by Patriarch Kirill of Moscow and All Russia to the Archpastors, Pastors, Deacons, Monastics and all the Faithful Children of the Russian Orthodox Church. From the depths of my heart I congratulate you all on the great and world-saving feast of the Nativity of our Lord Jesus Christ. Today, like the shepherds of Bethlehem two thousand years ago, with joy and loving-tenderness we hearken to the triumphant voice of the angel: «Glory to God in the highest, and on earth peace, good will toward men» (Lk 2:14). In hearing these wondrous words, our hearts find comfort and are filled with thanksgiving to the Maker. The Lord Almighty, «the mighty God, the everlasting Father» (Is 9:6), comes down to us and is born into the world as a simple human being. The psalmist and prophet David proclaimed these words through the Holy Spirit which have come true: «Mercy and truth are met together; righteousness and peace have kissed each other. Truth shall spring out of the earth; and righteousness shall look down from heaven» (Ps 85:10-11). And it has come to pass that «unto us a child is born, unto us a son is given (Is 9:6) that whosoever believes in him should not perish, but have everlasting life» (Jn 3:16). Throughout history humankind has assiduously sought out God, longing for the lost communion with its Maker. And in response to these endeavours, in response to hearts and hands raised up towards the heavens, the Lord has manifested his love for the human race and has extended towards us his saving hand. After thousands of years God and the human person have finally encountered each other in Jesus Christ, heaven and earth have been united, and the hopes of the sons and daughters of Adam have been fulfilled. In Christ’s Nativity there has been revealed to us at one and the same time both a Mystery and a Revelation. The human mind is indeed unable to grasp fully how the Maker and Provider of the world — God, who by his nature is boundless — comes into our world torn apart by sin and reveals himself in the form of a helpless Child born in the cave where the shepherds and the animals sought refuge from the bad weather. The glory which was exalted by the heavenly powers, disseminated by the wise men from the east and witnessed by the humble shepherds, is proclaimed loudly to all ends of the earth. All of this allows us to glimpse the depths of the unfathomable wisdom of God, it makes us a part of the Trinity’s hidden plan for the salvation of the human person. Today we know that «God so loved the world, that he gave his only begotten Son… so that the world through him might be saved» (Jn 3:16-17). And now, «being justified by faith, we have peace with God through our Lord Jesus Christ: By whom also we have access by faith into this grace wherein we stand, and rejoice in hope of the glory of God, … because the love of God is shed abroad in our hearts by the Holy Spirit which is given unto us» (Rom 5:1-2, 5). Let us, then, bow reverently before the humble manger where the quiet and meek Infant lies. Let us bow down with the fear of God and trembling, for it is here that there begins the earthly way of the cross of the Lord Jesus, it is here that our salvation begins. Let us bow down and glorify the Son who is born of the Pre-eternal Father, rejoicing in the ineffable peace which surpasses all understanding and which fills our souls. «Glory to God in the highest, and on earth peace, good will toward men» we again and again joyfully sing after the choir of angels. The love of God, revealed in the Nativity of the Saviour, brings true peace to people. This peace cannot be shaken either by everyday turmoil, social upheaval, political chaos or even armed conflict, for «in Christ’s peace there mysteriously lives such a spiritual power which can subdue all earthly affliction and beguilements» (St. Ignatius Bryanchaninov, Ascetic Works). Yet how are we to acquire a peaceful disposition of the heart? How are we to become the possessors of this great spiritual gift? The holy fathers are unanimous in stating that the work of Christ’s peace in a human being is a true sign of his abiding in the Gospel commandments. Of them «above all» — we are taught by the apostle Paul — «put on charity, which is the bond of perfectness. And let the peace of God», says the apostle, «rule in your hearts, to which also you are called» (Col 3:14-15). The Lord seeks out people of good will — those people who observe his law, who will testify to those near and those afar to salvation and «proclaim the mighty acts of him who has called you out of darkness into his marvellous light» (1 Pet 2:9). Let us, then, be worthy of this lofty calling and thereby, «seeing thy most glorious Nativity, which took place in the cave, let us all the more spurn the vanities of the world» (8th Kontakion of the Akathist Hymn to the Nativity of Christ), and we shall be transported spiritually to the heavens in glorifying the Maker of all things and in sharing our joy in the incarnate Saviour with those around us, with those who need our care, who are downcast or who are in straightened circumstances. May the Lord inspire us all upon the arduous Christian life so that henceforth faith be strengthened within us, that hope fades not and that love shall ever grow; so that as we become part of the solemnity of the radiant feast of the Nativity we shall unceasingly proclaim to the world the «great mystery of godliness» (1 Tim 3:16) and bring comfort and Christ’s blessed peace to people. Amen.